Since the last global financial crisis, the sustained suppression of interest rates by global central banks has contributed to broad-based inflation in asset prices, rewarding investors that have participated indiscriminately in the prevailing yield chase in global bond markets. 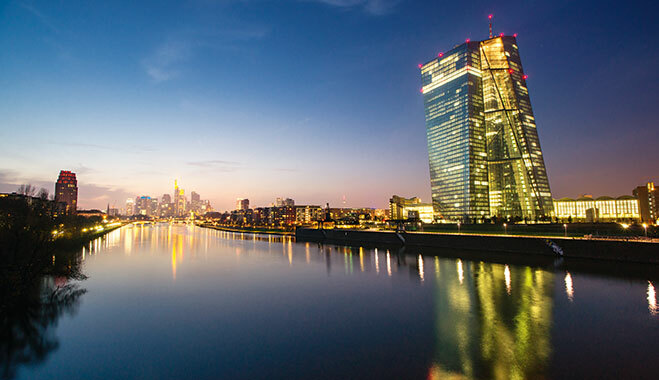 In March, the European Central Bank (ECB) launched a full-blown quantitative easing programme with asset purchases expected to be roughly €60bn ($64.96bn) monthly through September 2016 – adding over €1trn ($1.08trn) to ECB assets – with a concentration on sovereign bonds of eurozone countries. With 10-year yields on German sovereign bonds trading at around 0.10 percent as of April 22 2015 (with some forecasters predicting yields to go negative) and 30-year yields on German sovereign bonds trading at an astonishing 0.48 percent, the level of duration risk being taken by investors is alarming. Low yields are not simply a ‘core’ European phenomenon, with 10-year yields on Portuguese sovereign bonds yielding 2.07 percent in the same period, having been as high as 18.3 percent in January 2012. At the short end of the curve, we continue to witness unprecedented events, for instance, three month Euribor turned negative for the first time on April 21 2015 (put simply banks are now paying each other to get cash off their balance sheets). Spain also sold treasury bills with similar maturity at a yield of negative (0.029 percent). Also as of April 21 2015, core bond yields in the five-years sector are approaching (0.2 percent). The average yield on eurozone bonds yields was 0.5 percent on the same date and astonishingly €2trn ($2.16trn) of European government debt now trades at negative yields. Bond market bulls will argue that with 40 countries in deflation and over 20 central banks cutting rates since the start of the year through the end of the first quarter of 2015, globally monetary policy remains on balance towards easing and investors will be continually encouraged to take more duration risk in order to earn some form of return. What’s more, the outlook for global growth remains muted as the global economy continues to deleverage. At the IMF’s biannual World Economic Outlook conference on April 14 2015, the IMF noted that despite slightly improved growth forecasts (2016 forecast was previously 0.1 percent lower at 3.7 percent) the outlook for economic recovery is still ‘moderate and uneven’ with concerns that financial and geopolitical risks have increased in recent months. Regulatory tailwinds are also in place for bond markets. For example, under the existing regulatory treatment in place, sovereign debt carries a zero-risk weighting meaning banks are permitted to hold little or no capital against sovereign debt. Furthermore incoming legislation such as Solvency II that will regulate the €7trn ($7.59trn) European insurance industry focuses on ‘asset risk’, forcing insurers to evaluate the assets they invest in from a cost and risk budgeting perspective. Under Solvency II, a capital charge of 39 percent will apply for global equities but debt-related instruments are scheduled to be cheaper at 15 percent, forcing insurers to look to debt assets. The result of yields this low is that investors are being forced to move down the yield curve to find return and secondly invest in more risky assets in pursuit of yield. Although one of the arguments of quantitative easing is that it should stimulate credit growth, many believe negative rates are unlikely to stimulate credit creation. On the contrary, some financial commentators argue that this initiative could actually decrease credit supply as bank profits margins tighten and capital is misallocated to riskier borrowers that in turn could eventually increase non-performing loans. The energy sector in the US high-yield bond market serves as a topical example of the repricing of risk that can abruptly occur after credit ‘binges’. Of the $121bn of US high-yield principal trading at distressed levels (meaning credit spreads above 1,000 basis points), energy exploration and production companies in April 2015 accounted for $38bn (31 percent), metals, mining and steel corporates account for $24bn (20 percent) and oilfield equipment and services account for $15bn (12 percent). To put this in context the next largest sector after energy is specialty retail that accounted for only five percent. The energy sector has accounted for 15-20 percent of US high-yield bond issuance in recent years growing to over 15 percent of the US high-yield bond index. As a consequence, the decline in the high-yield energy sector in the fourth quarter in 2014 dragged the whole US high yield market with it. Faced with corporate credit yields continuing to make new lows and credit supply offering inadequate compensation for fundamental credit risks, many traditional bond investors have been forced to turn to equities but the volatility of the asset class for some investors can be problematic. For example, since 1972 the S&P 500 has fallen more than seven percent on 28 occasions. Aside of a strategic shift into equities, investors are looking at unconstrained bond strategies or absolute return fixed income and relative value credit strategies with a view to trying to generate returns historically associated with exposure to global bonds that are no longer available without exposing themselves to excessive interest rate and credit risk. Byron Capital Partners launched the Byron Fixed Income Alpha Fund (BFIAF) in November 2010 that focuses on absolute return fixed income and relative value credit. Furthermore the BFIAF operates in a UCITS-compliant structure, domiciled in Ireland that offers investors weekly liquidity. The strategy works well in a UCITS structure, although leverage in UCITS is restricted as well as shorting limitations so the quality of the asset management is truly tested. During and following the 2008 financial crisis, the comparative advantages of UCITS funds manifested themselves and the structure addresses prominent investor concerns such as liquidity, regulation, custody of assets, transparency and risk management. UCITS IV provided the flexibility for absolute return strategies to be run effectively in a UCITS structure with the scope to offer hedge fund like risk-return profiles in a regulated, liquid and transparent product offering. In Europe (and now outside of Europe), the UCITS directive has evolved into one of the most widely recognised regulatory frameworks of investment funds, allowing investors to access absolute return strategies through UCITS-compliant onshore structures while obtaining increased transparency and liquidity. In addition UCITS funds explicitly lie outside of the alternative investment fund managers directive scope and already possess a European passport allowing distribution across Europe. The fund has produced an excellent performance over the last three years, with the institutional share class returning 7.43 percent, 3.46 percent and 3.11 percent net of fees in 2012, 2013 and 2014 respectively corresponding to a Sharpe ratio of 2.34, which resulted in a major European performance award. 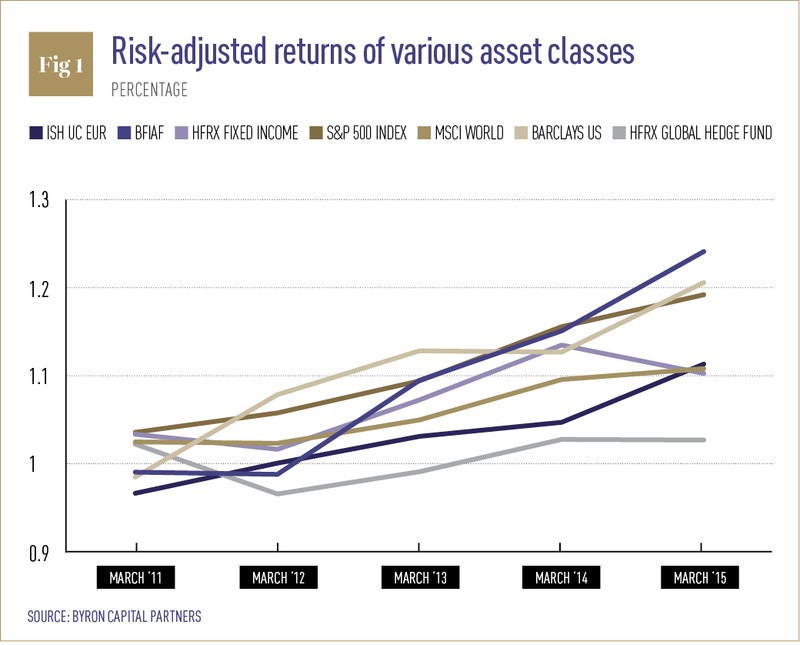 This year has seen a very strong performance by the fund, and indeed risk-adjusted returns against other asset classes have been positive since its inception (see Fig. 1). Duration is tightly managed and stood at approximately 2.55 on April 22 2015 and the manager aims to maintain an average portfolio credit rating of investment grade. As of April 22 2015, the portfolio’s average credit rating was BBB-. High-yield exposure is capped as per the fund’s prospectus at 40 percent. In terms of their outlook and positing for the fund, the investment management team see no value in European sovereign debt but believe there are still opportunities in some selective European corporate bonds. They also believe some crossover names in the emerging market space offer value. The energy sector is an interesting sector in the bond market given pricing dynamics outlined above, however, the investment management team is particularly conscious of liquidity concerns in this sector. Given the fund offers investors weekly liquidity, liquidity considerations for the asset base of the fund are of significant importance to ensure investor redemptions can be managed in an efficient manner. With short-term interest rates in the developed world remaining low and even negative for the foreseeable future, particularly in Europe, a premium will be put on the ability to generate positive returns from global fixed income and credit portfolios without exposing investors to excessive duration and credit risk as well as illiquidity. With investors under increasing pressure to produce positive returns from fixed income investments, the prospects for absolute return fixed income and relative value credit, particularly in a regulated structure, look favourable and offer a compelling alternative to a rotation into equities that arguably remain expensive on both a cyclically adjusted and historical basis.